Designed to deliver high-performance, precise cutting, and optimal driving comfort, Hustler’s broad range of zero turn mowers are built to the highest standards, and with the world-famous quality that the Hustler® brand has delivered for over 50 years. No matter if you’re in the market for a new zero turn mower to tackle your lawn at home or to handle the demands of a full client list in your lawn care business, Hustler has a solution to exceed expectations. Hustler’s residential zero turns can handle rugged terrain with ease while delivering fast and precise cutting to demanding homeowners, while Hustler’s commercial-grade zero turns are just the thing for those who seek serious performance and more mowing horsepower at a great value. To determine the best buy for your particular application, let’s take a look at the features and specs of Hustler’s impressive selection of zero turn mowers. A legendary family of zero turn mowers that offers a wide range of power, comfort, and convenience options, Hustler’s residential mowers bring home value and reliability that’s unmatched. Let’s check out the models. Raptor SD – A premium and heavy-duty mower with exceptional handling and control, the Raptor SD is perfect for larger yards with varied turf conditions and terrain. Like the lighter duty original Raptor mowers, the Raptor SD offers a variety of deck size and engine options from Kohler and Kawasaki, though it also adds many of the comfort and convenience features found on the one-size-fits-all Raptor Limited with even burlier tires. Raptor SDX – Available exclusively with a 54” deck and Kawasaki 23HP FR691V engine, the Raptor SDX features an open deck design and can cut grass from heights of 1.5”-4.5”. Luxury features like an adjustable premium seat with armrests and internal suspension for extreme rider comfort, as well as a cup holder for your frosty beverage, come standard on the Raptor SDX. Raptor Flip-Up – At just the press of a button, you can automatically raise, lower, and adjust the deck height on the Raptor Flip-Up. The Flip-Up requires less storage space than other Raptors thanks to patent-pending QuickFlip™ technology that makes for simple cleaning and blade maintenance. Available with Kohler’s 25HP 7000 Series HD engine w/SmartChoke™ in a 48” or 54” deck size. FasTrak® – The FasTrak is Hustler’s commercial-grade residential zero turn mower that’s specially engineered to meet the needs of the most demanding yards and homeowners. A wide variety of mower deck size options from 48”-60”, as well as commercial-style side or rear discharge formats are available on the FasTrak. Large 22” drive tires and commercial grade transmissions round out the standard features on this premium mower. Hustler’s range of commercial zero turns offer users flawless and professional cutting experiences every time. 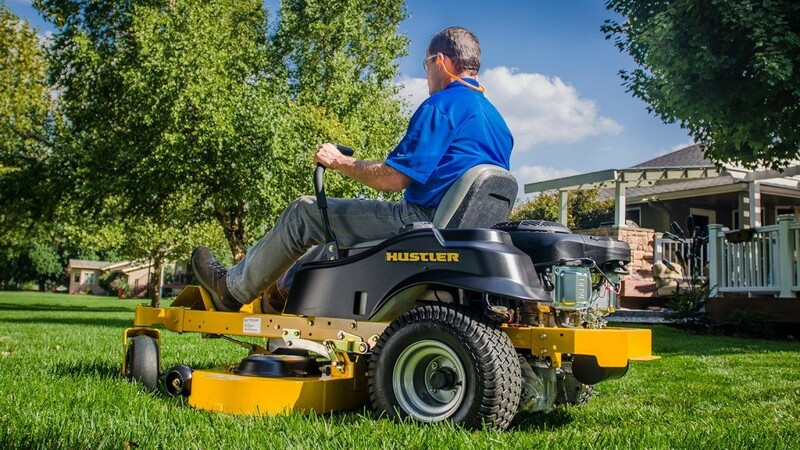 With intuitive controls, high-performance engines, and comfort features that lawn care experts want, Hustler’s commercial fleet has the perfect model for every situation. Let’s hit the highlights of the most popular models. X-One® – Looking for a commercial zero turn that offers excellent performance all day, every day? With choices between fuel-injected or carbureted, high-horsepower engines from Kohler and Kawasaki, and a wide selection of side and rear-discharge decks in sizes between 52” and 72”, the X-One will assure that your full-time hours spent mowing are trouble-free, and perhaps even enjoyable. Super Z® – The Super Z is an outstanding choice for the commercial landscaper with heavy-duty hydraulics that delivers more power and torque than the competition. Powerful engine options from Kohler and Kawasaki can assure speeds of up to 14mph for lightning-quick mowing. A wide selection of side and rear-discharge decks with Hustler’s critically acclaimed VX4 technology in sizes between 54” and 72” provide you with options for a perfect cut every time no matter what types of lawns you typically tackle. Lastly, unmatched comfort can be found in the famed Grammer suspension seats with standard armrests. Super Z® HyperDrive® – Need an ultra-durable drive system for harsh mowing conditions? The Super Z HyperDrive takes some of the very best features of the original Super Z and kicks things up a notch. The HyperDrive Hydro transmission system is the most substantial and durable drive system in the industry to allow mowing in the harshest conditions without losing performance. Powerful Vanguard Big Block engine options allow for top mowing speeds of 16mph, while a wide selection of side and rear-discharge decks with Hustler’s critically acclaimed VX4 technology in sizes of 60”, 66”, and 72” provide you with excellent options for a perfect cut every time. Z Diesel – Prefer the fuel economy of a diesel engine? The Z Diesel may be the ideal zero turn mower for your business. With heavy-duty 25-horsepower Shibaura engines that feature a service-friendly design for easy maintenance, you’ll be happy you made the diesel choice. 60” or 72” side or rear-discharge decks allow you to get the perfect cut in the format you prefer. Super 104™ – Need to mow a football field in 7 minutes, or 84 acres in 8 hours? The Super 104 is an affordable wide-area solution that features a 104” deck – you read that correctly – it’s the only one in its class! With zero turn precision, this big machine has a convenient 80” transport width, 12-gallon fuel capacity, and 11mph top speed. If you’re regularly challenged to mow wide open spaces of many acres, the Super 104 is worth considering. With the wide variety of Hustler zero turn mowers available, it can be difficult to select your favorite. Let our expert staff at PowerPro Equipment help you choose the right zero turn mower for your needs. Get in touch today to schedule a test-drive, to find out more or if you’re ready to purchase!